Gorgeous gift tags created by the talented Trudy Florence. For further information on downloading these gift tags, click here. 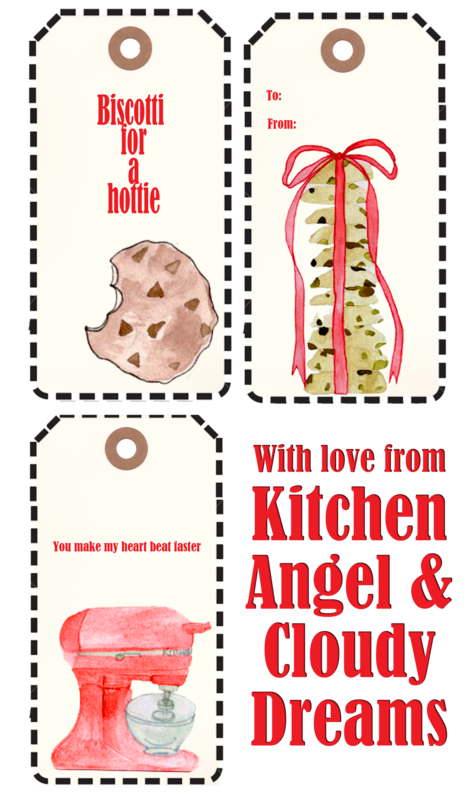 We’ve been lucky enough to collaborate with the very talented Trudy Florence from Cloudy Dreams, who has created some FREE Kitchen Angel inspired gift tags for you. These can be downloaded and attached to any baking mixes, supplies, gift packs or baked creations to show that lucky somebody how much you care. Sick of taking wine to your party host? Not sure what you could bake that’s a little different for Christmas? Limited for time to whip something up to take to a party? Well the Stelline Pack is just for you! The world doesn’t need another cupcake. There are hundreds, if not thousands, of fabulous cupcakes already. What the world needs is a Chocolate Tart with Candied Clementines. Imagine a parcel of essential vitamins, minerals and antioxidants wrapped in a bow. You must be going nuts! Gift pack contains 800g mixed nuts in a beautiful Italian designed and made tin. Over the course of 1.5 hours enjoy a baking session using 2 Kitchen Angel mixes with our talented pastry chef; a cup of coffee/tea & freshly baked biscuits. Plus you get 25% off all Kitchen Angel products in store on the day. * contact us at admin@kitchenangel.com.au to confirm our next Coffee & Bake session. ** please note a minimum of 3 people is required for this class. For large groups or corporate bookings of 10 people or more, a 20% discount applies. Please contact us via admin@kitchenangel.com.au should you wish to make a large group booking.